Now you can build a blog right from your FolioLink admin area. Best of all the blog is integrated with your domain name which can help boost your website’s search engine visibility. 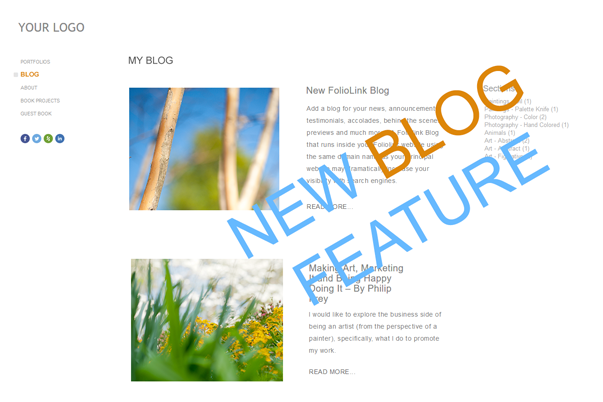 You will find that the new FolioLink blog feature is a simple and effective way to manage news, announcements, testimonials, accolades, behind the scenes previews and other content of interest that benefits from a blog layout. This addition to the FolioLink service comes bundled with our Premium and Pro Accounts and can be added on to other account types for a nominal fee. Learn more about this new feature. Click to view our new video about the blog.